[Feature].Secure Pause pauses recording of the conversation. [Feature].End Secure Pause resumes recording. In this example, you create a custom action that starts or ends a secure pause when the agent selects or clears a check box. 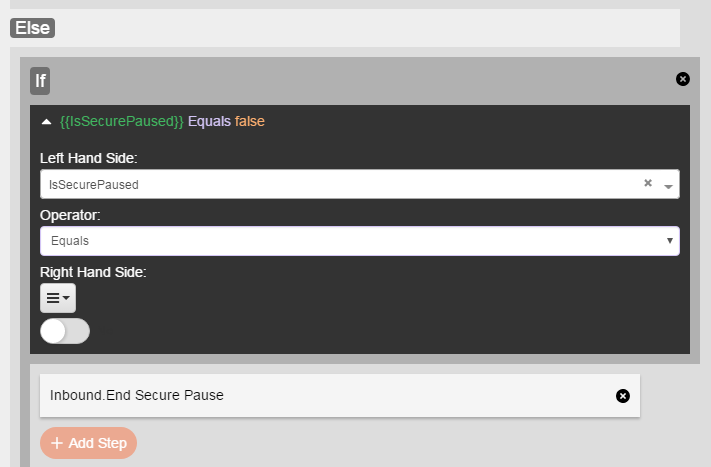 You could also use separate buttons or other components to control secure pause in scripts. Enable either the Inbound or Outbound script features. 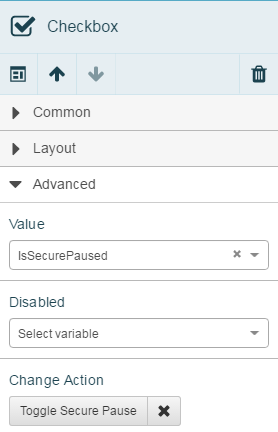 This step gives you access the Secure Pause and End Secure Pause actions for the feature that you enable. Set the default value to No (False). In this example, the variable is named IsSecurePaused. In this example, the action is named Toggle Secure Pause. In the action, add an If/Else step. Left Hand Side: IsSecurePaused (the variable that you previously created). Right Hand Side: True/False, set to True. From the list of actions, select Outbound.Secure Pause or Inbound.Secure Pause. Under Else, click Add Step. Right Hand Side: True/False, set to No. From the list of actions, select Outbound.End Secure Pause or Inbound.End Secure Pause. 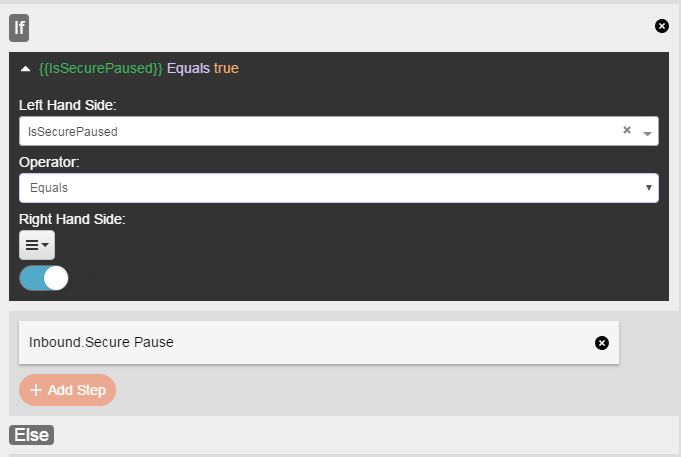 Add a check box component to the page and set its Text property to Secure Pause. Set the Value of the check box to the IsSecurePaused variable that you created earlier. This step binds the control to the variable. When an agent selects the box, the value of the variable is True, and when an agent clears the box, the value is False. 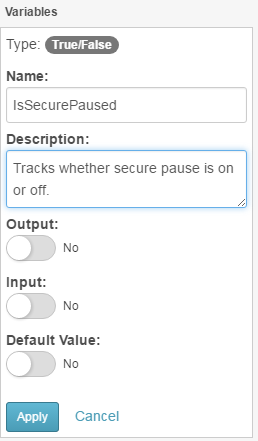 Under Advanced, set the Change Action of the check box to the Toggle Secure Pause action that you created earlier. To test your work, click Preview Script. When you check the box, the preview displays Would have begun secure pause. When you clear the box, the preview displays Would have ended secure pause. These messages indicate that the control is working properly. On the Script menu, click Save.